WASHINGTON (CNN) -- There was candid frustration Thursday coming from rank-and-file congressional Democrats about the influence of Maine's Republican senator in the health care reform debate. 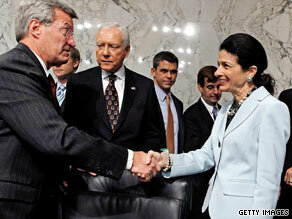 Senate Finance Committee Chairman Max Baucus and Maine Republican Sen. Olympia Snowe on Tuesday. The way Republican Sen. Olympia Snowe sees it, she's just using the power any senator has: the power of one. "The brilliance of our Founding Fathers was this: that they gave power equally to every member of the United States Senate, whether you represented a large state or a small state, and exercising that authority in a positive way," she said. But the challenge now for Democrats is that Snowe opposes what most of them support: a government-sponsored health care option. President Obama has singled out Snowe "for both the political courage and the seriousness of purpose that she's demonstrated throughout this process." But Rep. Bobby Scott, D-Virginia, said he understands how important it is to President Obama to be able to call his health care bill bipartisan. "It looks as though the way the White House is maneuvering right now, that it is incredibly important to them to get at least one Republican, that being Olympia Snowe." When asked whether Snowe has more influence than House Speaker Nancy Pelosi on how the final bill will shape up, Pelosi responded: "I respect Sen. Snowe and the role she has constructed, the role she has played in the deliberations for the Senate Finance Committee." Senate Majority Leader Harry Reid said that his hope is for more Republicans to work with Democrats and not just "one senator from Maine." Senate Democrats gathered behind closed doors Thursday for what Democratic sources say was a spirited and at times tense meeting on how to proceed on health care. But the struggle for Democratic leaders is that the public option will unlikely fly with some conservative Democrats and Snowe. House Democrats, meanwhile, wasted no time in blasting Snowe's recent influence in the controversial debate. "This is the United States of America. This is not the United States of Maine," said Rep. Lynn Woolsey, D-California. "I mean that one senator cannot hold the entire nation's health care plan hostage." Snowe believes that a public option should be "triggered" down the road only if market reforms fail to bring health care costs down. Rep. Sheila Jackson Lee, D-Texas, blasted the idea of a trigger option. "The idea that we are going to succumb to the insurance industry's fears and then do a trigger, which means that our constituency -- the American people -- will delay in getting a public option, that's like the house of cards just collapsing on top of us," she said. Republican colleagues, however, have remained mostly silent on Snowe's vote. "Sen. Snowe called me this morning to let me know that while she continues to have serious, substantive policy reservations with this proposal, she wanted to keep the process moving," Senate Minority Leader Mitch McConnell said in a news release Tuesday. "I share her concerns about the direction of this bill once it leaves the committee, and her call for transparency before we vote to proceed to any bill on the floor." House Republican Leader John Boehner, who did not criticize Snowe in a statement after the vote, blasted Democratic plans, such as the one coming from the Senate Finance Committee. "Republicans have offered common-sense solutions to lower health care costs and increase access to affordable insurance -- all without destroying jobs, exploding the deficit, or putting bureaucrats in charge of medical decisions that should be made by doctors and patients," he said in a statement Tuesday. "It's time for Democrats to scrap all of these big government-run plans and work with Republicans to make health care more affordable and accessible for all Americans." Snowe says that at the end of the day, it's about "doing the best thing for the American people, what's in the best interests of this country." Her stance on health care is hardly the first time the moderate senator has broken ranks with her party. This year, she was one of just three Republicans to support the president's $787 billion economic stimulus package. She also broke ranks with Republicans on social issues like stem cell research and abortion. Although her liberal leanings have the possibility of putting her at odds with her party, Snowe's constituents don't seem to mind. Voters re-elected her to the Senate with 74 percent of the vote in 2006, compared with her Democratic opponent's 21 percent. In 2000, she won with 69 percent of the vote.